What if you had different authors each write the same story? What would each of them bring to the piece in terms of style, tone, and resolution? That’s the question this anthology sets out to answer. Reading 5X5 asked twenty-five authors to tell five stories in five different ways. We started with story briefs in five different genres – each brief with just the basic information required to tell a story. Then we asked five authors to write that story, each in their own way. The result is twenty-five great, fascinatingly different stories. 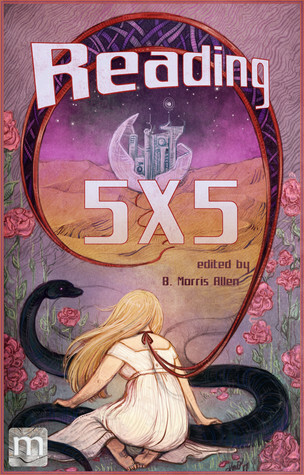 To put a fine point on it, I requested Reading 5x5 purely out of curiosity as a writer. As a reader, my initial thought was "who on earth would want to read the same story five times? Then do it four times more?" I was interested in looking at the mechanics of how such a collaboration might come together. What would a brief look like? Part way through the first story, I zipped to the end to skim the first brief. By the end of the second story, I found myself enjoying the stories and had mostly forgotten about the briefs! Eventually I found each group of five sufficiently varied that I had little send of reading the same story several times. All in all, a nicely rounded collection of short stories. The similarities are there for one who might want to dissect the briefs and analyze the writing. Other than one story which felt forced, the rest were four and five stars shorts, rich in description and world and satisfying in spite of limits of their length. Recommended for anyone who enjoys SF and Fantasy short stories.